Named by the flip of a coin in 1836, Berea grew from an agricultural area to a quarry town as a result of the discovery of rich sandstone veins by John Baldwin. 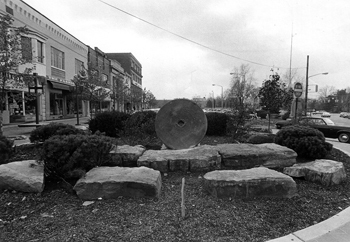 Fine quality grindstones were cut from Berea sandstone as the Berea quarries flourished from about 1840 through 1940. In 1845 John Baldwin founded the educational institution now known as Baldwin Wallace University, a highly regarded church related co-educational liberal arts college with a renowned Baldwin Wallace Conservatory of Music. Academic excellence is the priority in Berea-Midpark High School and private schools, as well as excellence in the humanities and physical arts. Located adjacent to the Cleveland Hopkins Airport and the interstate highway system, Berea is just 14 miles from Cleveland Public Square. The nearby Metroparks system affords outdoor recreation as well as the preservation of the peace and beauty of nature. Berea has outstanding architecture in churches, homes and businesses from as early as 1834. Progress through the years has brought many changes but the “home town” setting in the historic Western Reserve remains. Residents feel a pride in Berea which is reflected in the commitment to the preservation of Berea’s history.